This is a program where kids and teens gain access to submit their collection of short stories, articles, poems or letters or general life questions (edited and unedited) to be published for FREE and featured on weekly, monthly and quarterly tabloids, prints and social media platforms. My Writing Corner is set to help kids build and harness their reading and writing culture, to encourage self-expression, explore research, instill confidence and positive exposure in youths which will in turn, aid the development of kids’ writing and reading abilities, whilst catching them young. What’s in this for your child? 》Get their submissions edited for FREE by Aimee’s Library team. 》Get their submissions Published on our website and also stand a chance to have amazing writeups published on external blogs, social media pages and websites. 》Gain access to our Writing competitions. 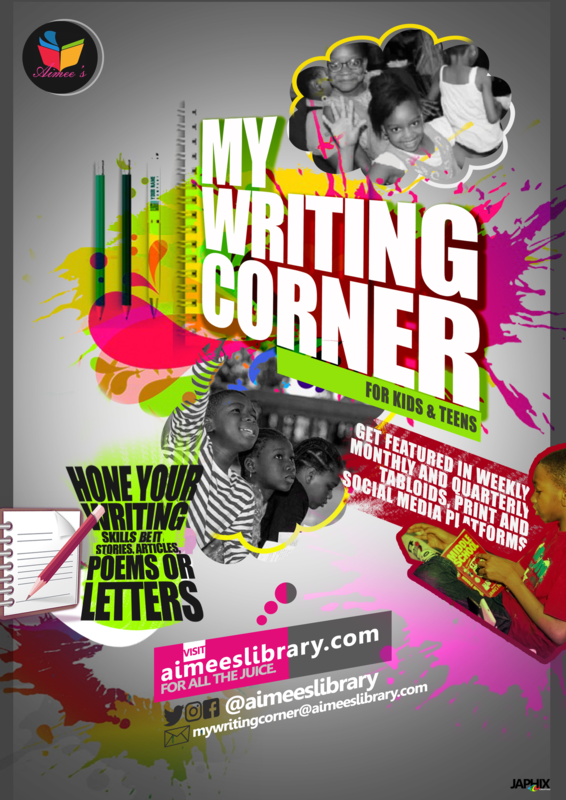 Visit aimeeslibrary.com for more information about Aimee’s as well as previous events and activities. Get to writing, we can’t wait to read from you! Stay tuned to Praiseworld Radio to listen to exclusive gospel tunes all day, everyday.